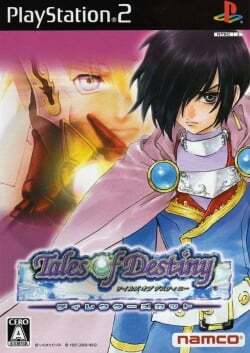 Game description: Tales of Destiny for the PS2 is an updated remake of the PSX game of the same name. Taking place in a fantasy world, the game follows the story of a young man named Stahn who comes across a sentient sword named Dymlos and his subsequent encounters with other similar sword-wielders. Eventually, he and his friends must unite against evil forces seeking use a relic from an ancient war. The story of the game begins when country-boy-turned-adventurer Stahn Aileron, who seeks fame and adventure, sneaks aboard the flying ship Draconis as a stowaway. He is found out by the crew and forced to work as a deckhand, but when a large hostile force attacks the ship, the crew is overwhelmed and Stahn breaks free during the ensuing chaos. Looking for a usable weapon to fend off the attackers, he gains access to a storeroom and discovers a "junk" sword. However, the sword starts talking to him, calling itself Dymlos and claiming to be a sentient Swordian from the Aeth'er Wars. Armed with Dymlos, Stahn fights his way to an escape pod, which he uses to escape the rapidly descending ship before it crashes into the ground. Dymlos becomes the key to the fame, fortune, and adventure Stahn seeks as the young man meets other Swordians, quickly becoming embroiled in a battle for a relic of the Aeth'er Wars: a huge, extremely powerful Lens called the Eye of Atamoni.